Received B.S in Physical Therapy and Rehabilitation at 1981 at Hacettepe University School of Physical Therapy and Rehabilitation and continued her graduate education at Hacettepe University Graduate School of Health Sciences she obtained M.S. in Audiology and Speech Language Therapy. Worked with children and adults with hearing and speech problems in Turkey, at Ankara University Medical School Ibni Sina Hospital, Department of ENT as Clinical Audiologist and speech therapist between 1984-1988. Cigdem moved to Florida, USA at 1989 and obtained her Florida PT License.She worked at the Rehabilitation department of Broward General Medical Center at Fort Lauderdale Florida, USA as a Physical therapist, clinical instructor, outpatient services coordinator for 4 years. Experienced at various multidisciplinary settings with occupational and physical therapist, speech therapists to provide service for children including ;multiple handicapped ,speech and language impaired, developmentally delayed,fetal alcohol syndrome, autism spectrum disorders, CP, trauma, birth defects, motor and mentally challenged.Continued to work at several outpatient fascillities and hospitals.Attended several training programs, workshops and seminars in the field of speech and language disorders, sensory integration therapy, oral motor therapy and early intervention, observed at many different clinics and hospitals to learn about new methods and interventions such as; Miami Children's Hospital, University of Miami Mailman Child Development Center, Easter Seals Society, University of Florida Shands Hospital. John Hopkins Kennedy Krieger Institute. Moved back to Turkey at 2000 and worked for Tohum Foundation (Foundation for Early Diagnosis and Education of Autism in Turkey) as a coordinator to establish a therapy center and school for children with autism. Tohum;being a non profit organization, aimed to bring quality services to Turkey,educate professionals in autism. Visited various clinics and schools, and observed different therapy methods at USA in order to set up a system in Istanbul. Her background with PT and speech therapy helped her to build and organize a team of physical therapists, occupational therapist, psychologists, special education teachers, and a speech language therapist. 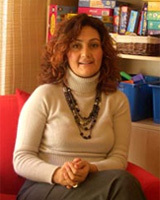 Established Gunısıgı Child Center at 2004 with Suna Polat as a multidisciplinary clinic for diagnostic and therapeutic services for children and their families. Supervises and provides continuing educational services to the team, including comprehensive assessment, case management, individual educational program developing with collaboration of multidisciplinary team in addition to her clinical work with children and families. Teaches 'Speech and Hearing Disorders' course at Istanbul University School of Physical Therapy and Rehabilitation since 2004.Yeditepe University School of Physical Therapy and Rehabilitation since 2009. DIR Floortime: certificate candidate level 3. In the process of case write up. Assessing and Treating Regulatory,Emotional,and Sensory Deficits in Infants and Young Children. Georgia De Ganghi .PhD.,OTR,FAOTA 09/2010 Cork, Ireland.